Adrian drew this route to the locations of Alan's first nine depictions. The next morning, Alan woke up in his upstairs apartment, vaguely remembering his late-night walk back from Adrian's house. Alan's head felt only a little bit thick; not quite a hangover but close. 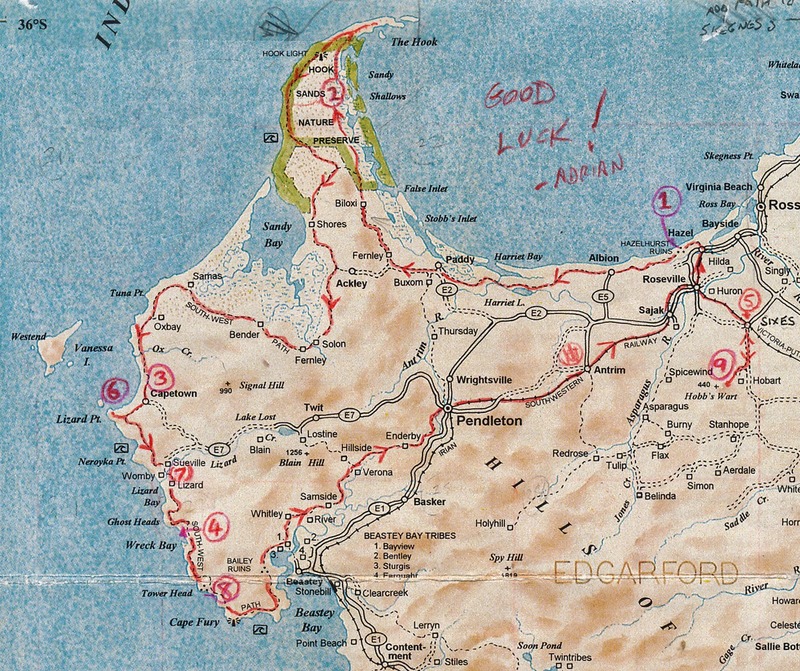 As he got dressed, he thought of his picture list again, so he picked up his road map and went to find Adrian. "Ahoy down there," Alan called down. Adrian returned an "ahoy" and Alan found him pouring coffee in the back room. Adrian noticed Alan's map and said, "Let's look over that list of yours." So they sat down with their coffee at the makeshift dining table in the back of the gallery. Adrian looked at the list and started marking Alan's map while Alan loaded his coffee with just the right levels of sugar and milk. Osborne, once again, had settled an Alan's lap. "Okay, most of these first sites are just west of us - and the best way to reach them is on foot." "Oh...well, I'm glad I bought hiking gear. How much of a walk are we talking about?" "Well, it'll be a long one - several days, maybe two weeks. Here, I marked most of the spots they want depicted, and I penciled in your route. The paths are well-posted with signs and mile-markers. You'll find inns along the way if you don't want to camp out every night." "Inns? Sounds like long-ago England..."
"Oh, wait 'till you visit one or two of them. They are one-of-a-kind establishments meant for walkers or wanderers who want a bath and a comfortable bunk for the night. Most serve supper and a toddy, and then a good breakfast in the morning. You'll also meet other walkers; they are quite a community!" Alan stared at the red lines Adrian had drawn, and then said, "Uumm, this looks like a LONG walk." You should be fine out there," Adrian said. "It's an easy walk, and then you can catch the train at Pendleton for the last couple of stops. The weather forecast is clouds then sun, then maybe a storm in a few days. Just watch the sky and find shelter if it looks nasty! I heard the surf might get rough out there, but it shouldn't be too bad where you are going. "Also, this time of year is great for late afternoon skies," Adrian added, "especially near sunset. For the picturing, that is. I've gone out there a couple of times, so I know." Alan looked at the map. "I sure appreciate your help here," he said. "I think I can follow this all right - it looks like a two-day walk just to reach the Hook." Then, "I see there is a road here, this 'E-2'. Couldn't I take a bus to Paddy or Fernley?" "Yes, but the bus only runs once a week out there, and I think it just ran yesterday. Those are subsistence towns on that whole western shore - very little need for much travel by road. People out there just walk. Oh, and out on the Hook you might encounter people going 'sky clad' - wearing no clothes at all!" According to Heisenburg, when a quantum particle is not observed it exists as an ensemble of ''possibilities'' (in physics called a virtual state) in which it has a likelihood of existing simultaneously at all points of space; however, when an observation is performed the quantum particle makes a discontinuous jump (called a quantum transition) to a state with some definite position and is said to be in a condition of ''actuality'' (in physics called a physical state). As the evening progressed, Adrian noticed that Alan seemed more relaxed. "And by the way, how are you feeling? You look a little better than you did the other night." Alan sipped some more wine. "Oh, I'm feeling fine right now." "Ahh, yes. Me too. More wine?" "You know, Alan, I've never been out of this country, so I've never gone through that experience you went through." "Oh, you mean that doorway in Fremantle?" "Yes, I'm curious about that. Is it still on your mind?" Alan sat back and pondered this whole new subject. "Well, it has been on my mind a little. I didn't think there was anything unusual about finding the Rudyard Lines office, but now I remember the blank looks I got from the hotel people and the cabbie when I asked about it. The cab driver never acknowledged the place even after I saw the sign and told him to stop. After I paid for the cab, I just walked up to the door, pulled the handle, and it opened. After all, I had my ticket! "So you assumed the door would open, and it did, and you just went in..."
"Yes! And then I was hit with this amazing buzzing sensation once I was inside - and it felt so refreshing, like I was being released from something. It's hard to describe it. Anyway, I felt lighter once I walked inside that building. The ticket lady gave me a long look at one point just before taking me to the boat. But then at the dock, she gave me the best hug I'd had in a long time, and said something like she was glad I made it this far." "Wow," Adrian replied. "Even before you arrived, this 'getting in' thing has been on my mind, and I've done a little reading. It seems that in quantum physics (bear with me now) there is a possibility that some things are uncertain or unknown until they are experienced by an observer. 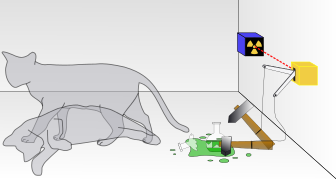 There has been much to-do about Schrodinger's cat*, and this seems similar, no? Until one pulls on the door of that Rudyard Lines office in Fremantle, one does not know whether the Rudyard Shipping Line, or that ticket lady you mentioned, will actually be in there or not. And that one doorway, as far as I know, is the only way to get to our island-nation! "And that," Adrian added, "brings up why many New Islanders are reluctant to travel abroad. There are rumors that some have left, intending to return, and have never been heard from again. We are well aware of that doorway, or portal, if you will, and that it might not be there for everyone." "And I see that Roger's Dreamland is on your list. That, too is a fascinating subject here. To get into the Dreamland, one must enter another 'portal' at a place called Three Rocks, which is on Twentymile Beach, far to the north, across the Sheffield Desert. A stone shelter containing a visitors' register and a doorway overlooking the surf has been built amid the three rocks. Some of those who walk up to the doorway 'see' the Dreamland unfold before them, and then they simply sign the book and walk in. For others, nothing changes - the beach remains the same." "So what do they do if they don't get in...can they try again?" "Not sure, I've never tried it." Adrian continued, "And that registry book at Three Rocks has many names of 'dreamers' who went in and never returned. Some have been gone for years. "Then my question, Alan, is this: Is Roger's Dreamland, or this whole island for that matter, like Schrodinger's cat - both there and not there until observed?" Alan took another sip of wine, stared out at what seemed like a very real moonlit shoreline, and finally said, "I have no idea what to tell you, Roger, er, I mean Adrian..."
Adrian's house originally had only two rooms. He built the one-story addition soon after he moved in. Early that morning, before his trip to Skegness, Adrian had invited Alan over for supper. It was easier to walk along the road, which didn't have any traffic, especially this late in the day. 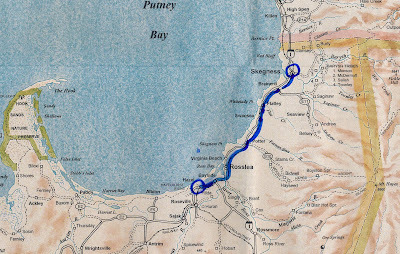 An evening train smoothly glided north, down the slope toward the bay, then another labored up the hill, heading south. Alan figured that's how everyone commutes around here, instead of driving. 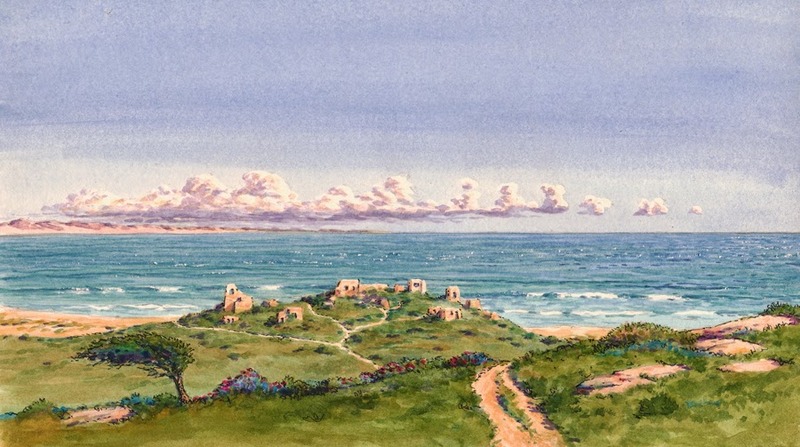 Adrian lived in a modest wood-and-stone house on a sandy hill overlooking Putney Bay and the Hazelhurst ruins. From the terrace outside, Alan could see all the places he was poking around in the day before. Adrian offered Alan a glass of local Riesling, "from the Severn Valley," claimed Adrian. Then they relaxed while a chicken with carrots and baby potatoes and Adrian's own herbs was slow-roasting in a wood-fired oven. Ahhh, the aroma was mouth-watering! Over supper, neither of them talked very much. The sun was setting over the ocean, the birds were quiet now, and the slightest breeze set off some wind chimes - enough going on to fill the moment. Adrian figured that Alan must have a lot on his mind, and decided to wait to see how their conversation might evolve. Alan felt good after all the chicken and trimmings. Adrian offered ice cream and another glass of Riesling. Alan accepted, and then sat back, feeling quite relaxed. Then he asked "Say Adrian, I can't help but wonder...have you ever been married, or had any kids?" A thoughtful moment, then, "Ahhh, yes...well, I married young. I fell madly in love with Tatyana, who was born here but was Russian through and through. I met her during a long trip on the mail boat. She agreed to marry me, and we had a daughter, Christal. But then, back in '92, when our country became independent, Tatyana wanted to return to Odessa with her family. I just couldn't go, since my own family, the Dougal clan, is rooted here, and I couldn't see myself living in Ukraine! I still think of Tatya, even though she has long since remarried and has three other kids now. Christal writes to me sometimes, sends me news, and maybe some day she'll come for a visit. She's almost 30 now! I have a few other friends that I visit, though, and they sustain me. You?" "Well, I was married once also. I met Barbara in California, when I was finishing up for my education degree. She and I were in the same program. We moved to Indiana because she has family there, and there were good teaching jobs then around Michigan City. We didn't have any children, but for about five years we seemed to get along fine, or at least okay. Eventually we broke up because she thought I was 'too quiet'. Actually, when we argued, I would sometimes clam up, which was the only way I knew how to fight back, and that would make her furious! Then later I met Michelle, and we were, I guess you'd say, dating, but we were not on great terms when I left. I'm pretty much on my own at this point..."
Adrian was quiet, then he said, "Well, I suppose this is good for your upcoming journey, yes? Though I think having a woman to come home to is, well, more desirable. For a while, I was hopeful that Mandrill, the woman who lived in your place, might be that kind of, um. mate." Adrian looked away, then took a long sip of his wine, and then declared, "I have found that the women on this island are very independently minded, so don't expect docility!" Then he said, "That list of yours is going to keep you on the road for a long time, Alan, but there is always the chance you'll meet some interesting people along the way. And if you keep your eyes open, there might be someone special out there!" This sentiment brought Carla to mind, but when Alan tried to fantasize what his next meeting with her might entail, his mind jumped to his friend Michelle, and such thoughts as, "What do I really want...?" Alan and Adrian walked from the gallery, over the hill at right, to Adrian's house, at left. Alan got on the train the next morning to get a sketching outfit for his long trip. 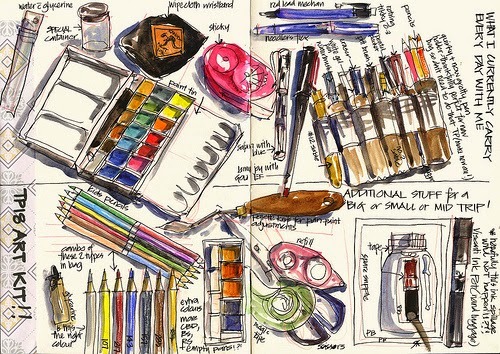 He had brought only a few pencils and his nearly-used-up paint set with him from the States, so he needed new watercolors, brushes, pencils, pens and paper, all compact enough to carry in his backpack. The train ride to Skegness took about 45 minutes. The late-season sun had just risen above the slopes of Mount Hayes, casting a warm glow on the landscape. 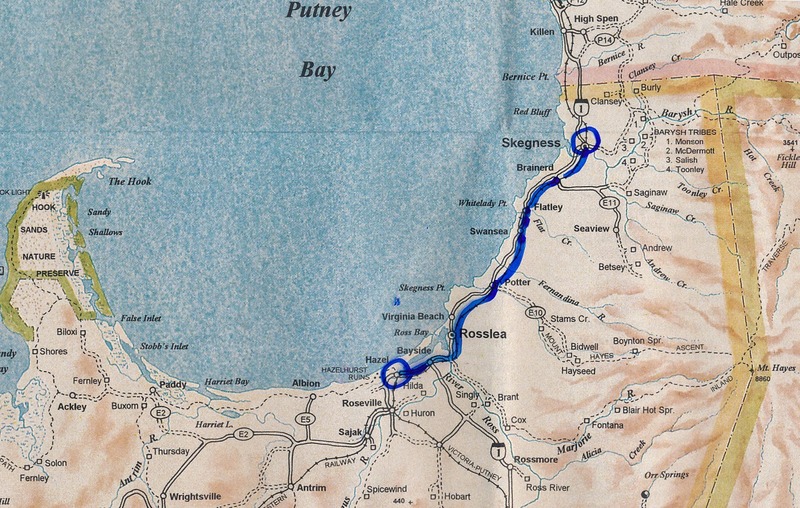 Outside of Hazel, Alan noticed small truck farms and a few dairy farms between the tracks and Ross Bay. Some of the barns and houses were of natural or whitewashed stone. Others were built with wood and painted in bright colors. All were quite small, especially compared to any he saw in Indiana. In Bayside, he noticed an increase in traffic on the highway next to him. He figured this must be Highway 1, the main road between Putney and Victoria Harbor. After Rosslea, the landscape opened up to low rolling hills with a distinct upslope to his right. The broad crater-rim of Mount Hayes peeked above a layer of clouds hugging the upper slope. It was the same mountain he saw from the boat coming into Victoria Harbor, but now it was much closer, and so large! On his left, Putney Bay spread out calm and blue, empty but for one large sailboat on the horizon. He wondered if it was one of mail boats that Adrian had mentioned. He realized that at some point he would probably be using their service to get to some of the places on his list. In Skegness, he walked out of the station and pulled out the directions to the Dromedary Bookshop that Adrian had given him. The town was densely built on some rather steep hills (old sand dunes?) and the streets marched straight up and over them, which reminded him of San Francisco, on a very small scale! The downtown hugged the Barysh River, and most of the shops were huddled together on one side of Fleet Street, the main thoroughfare. On the other side was the river, harboring scores of fishing and pleasure boats, all rigged for sail, hugging the short piers. He couldn't see a single power boat, save two brightly-colored skiffs marked "Constable", and a single ancient-looking tugboat. The Dromedary Bookshop and Etc. was on Fleet Street and easy to find. As he stepped inside, Alan was amazed at the colorful array of stationers papers of all kinds, samples of which were displayed along one wall. There were blank books and old-fashioned writing pens, plus aisles of published books (the bookstore part). He noticed that he was the only customer, and felt self-conscious as he asked the saleslady about art supplies. She pointed him to a display of brushes, inks, watercolors, oil paints, pencils, pads of drawing paper, a few stretched canvases, and a variety of "How to Draw" and "How to Paint" books. The chart on the wall was helpful. Alan found a travel set of watercolors, a few good brushes, some extra pencils and several Micron pens (They sell those here - Yess!) He also bought a thick packet of 8" by 10" watercolor sheets, cold press, and another of hot press. After lunch, Alan continued walking along Fleet Street thinking about camping gear and sure enough, he found a shop called The Cyclers' and Walkers' Outfitters Emporium. A very helpful young saleslady recommended the best in stoves, sleeping gear, cookware, foul weather gear, tents, backpacks and some great all-weather sandals. She was very helpful, and told Alan that her name was Sydney. As he boarded the afternoon train back to Hazel, the weight of his new pack (and the lightness of his wallet) felt okay, and he felt much better about this whole venture. At least he had adequate gear! Alan's route by train from Hazel to Skegness and back again. Alan's first sketch from his list - the Hazelhurst Ruins and Putney Bay. An okay start! A sign at the trailhead said "Southwest Path" in large letters, then below, "Hazelhurst-Hooksands Section" then a list of destinations with distance in miles. He was pleased at how close his lodgings were to some of the places he needed to find. It was still late morning, and the light, as Adrian predicted, wasn't quite right yet, so Alan decided to explore the ruins for a while. 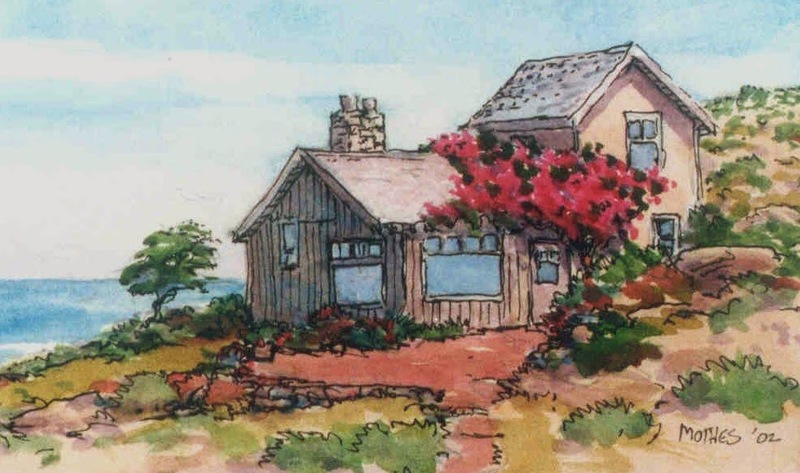 He figured this place must have been a smallish town, set on a low hill just above the beach. He wonders what they called it, what its name was. There were traces of stone streets or walkways, but the buildings are what caught his attention. They seemed like they could have been used by extended families or groups of families...each one had many rooms. He marveled at the tightly-fitted stonework, all very smooth on the surfaces. He looked for carvings or architectural ornament of some sort but found none. 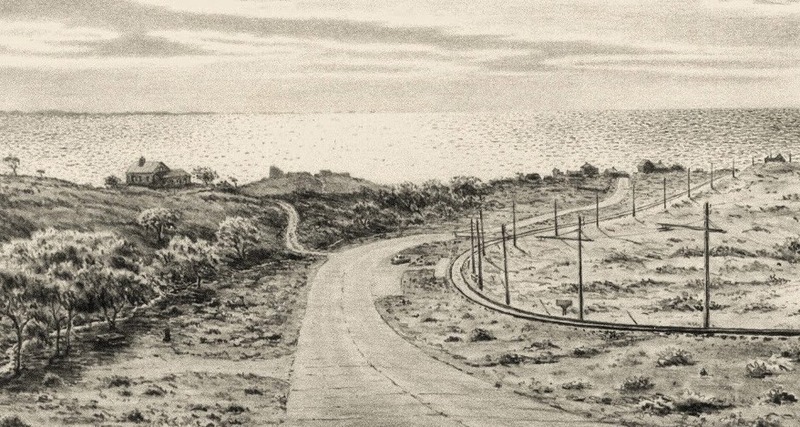 On the beach-side of the town, he noticed a roped-off section of several holes and dirt piles partly covered by a flimsy canvas-covered roof. Maybe this is where Mandrill had been working, probably looking for artifacts or bones or who knows what. There was no sign of activity now, that he could see. Alan had read on the back of his road map that a civilization called the "Old People" had once lived all over this island for "several thousand years", up until about 800 years ago. This was fascinating to him. He wondered, Who were they? What happened to them? 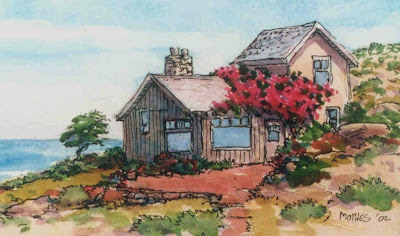 Finally, as the afternoon sun cast a softer light and created better shadows, Alan sat down along the main path, not very far from his lodgings, pulled out his paint box, mixed up some colors, and started a small watercolor. He sketched in the ruins, the bay, the clouds and continued until he had roughed in the foreground, right up to where he was sitting. It was a fine afternoon, and the sound of the surf and the soft, salty air seemed to soothe Alan's anxieties. He sat on a large rock out there for about two hours, and then spent another three at his kitchen table that evening to finish it...not too bad! Alan tried not to panic about The List as he biked into Hazel. (Just breathe...) He needed to concentrate now on what to buy for supper and breakfast. Within about five minutes he was in "downtown" Hazel! He soon observed that groceries in Hazel were to be had from three shops, all on the same block. A butcher shop displayed a severe sign that read "W. Randolph and Son, Butchery." Next door was the Ross Bay Produce shop, and a few doors down was a kind of convenience store called Maggie's that sold everything else. At the first two shops, Alan bought a steak for supper and bacon for later, then at the Ross Bay shop, some apples, oranges, and a big bunch of tiny reddish bananas. At Maggie's he bought sugar, salt, butter, milk, coffee, orange juice, eggs, oatmeal, some crackers, a bag of brown rice, a bottle of vodka and a packet of McVitie's digestive biscuits. He liked the look of the package - the picture said "cookies" clearly enough. Adrian's bike had a large carry-all basket behind the seat, and another up front, so he had no problem carrying everything back - and he arrived just as Adrian stepped outside to lock up. "Say, Adrian, thanks for the bike." "Quite all right. And I trust I'll see you tomorrow, yes?" "Um, okay, if we can meet early. I think I should go out first thing to try my hand at my assignment - there are 105 places on my list, and they want the first twenty-five in about two months! Those Hazelhurst ruins near here are item number one, so I guess I'll start there..." Alan's eyes showed a hint of panic. "Ah, sounds logical. But why not linger a bit and we can have some coffee. In fact, I'll make breakfast here in the back room. I've watched those ruins for years, and the best light I've seen on them is in the afternoon, so you needn't run off at dawn! And Alan, take a deep breath or two - you'll do fine! Also, give me your list and I'll look it over and try to make an itinerary for you. I know where most of the 'scenic places' are, and you look like you could use a hand!" Alan felt a warm kindness from this guy. He also sensed that Adrian might be hungering for company, since he didn't seem to have family around; at least he didn't speak of such. "Okay, see you for coffee in the morning, and I'll bring down some eggs!"